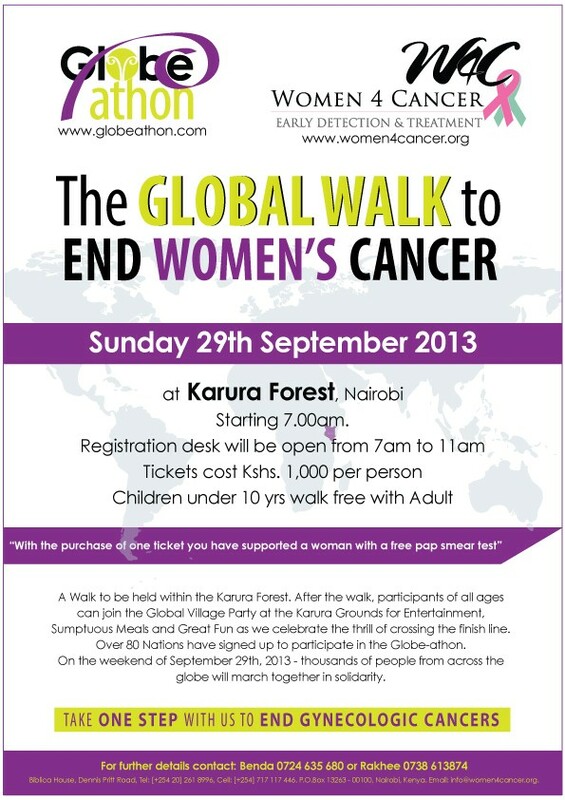 Globe-athon 2013 — Rocks Nairobi! This morning over 400 participants gathered in Karura Forest to stretch, walk, dance, laugh, drum, eat, and take a step to end women’s cancer. Globe-athon Walk to End Women’s Cancer is a global event, and Kenya was one of 80 countries that participated in this first-ever global cancer event! Women for Cancer Early Detection and Treatment, a KENCO partner organization, was the organizing team for today’s very successful gathering in Karura Forest. Several KENCO partners came out and shared cancer awareness materials with the event participants — Cancer Awareness Centre of Kenya, Stoma World Kenya, Faraja, Childhood Cancer Initiative, Hope and Courage International, Africa Cancer Foundation, HENZO — plus several ‘friends’ of KENCO. Funds raised today by Women for Cancer will go to support free pap smears for women. Congrats on a great event! Ecobank launches cancer awareness caravan to help arrest non-communicable diseases in time for treatment. “In Kenya, just like most African countries, there is very little information on Cancer which is largely viewed as a disease of the rich and old.” Ecobank Kenya has set aside Ksh12 million for sponsorship of cancer interventions across the country through an awareness campaign funded by the Ecobank Foundation. The bank made the announcement during its official launch of the cancer campaign drive dubbed Ecobank Cancer Caravan last week. The campaign will involve screening for prostate and cervical cancer in different parts of the country during the month of October. Ecobank is partnering with the Kenya Medical Women’s Association (KMWA) to hold cancer screening camps across the country for the next one month where free testing for prostate and cervical cancer and counseling services will be carried out. This is expected to help in early detection, increase awareness on causes of cancer, treatment and prevention. The Bank also announced that it would donate cancer treatment equipment to the Kenyatta National Hospital (KNH) at the end of its Caravan in October, in addition to free treatment for selected cancer patients in partnership with KNH, East Africa’s largest referral hospital. The Ecobank Cancer Caravan screening camps will be held in Nairobi, Nakuru, Kisumu, Karatina, Meru and Mombasa and will be open for free to the Bank’s customers, employees and members of the public. Speaking during the launch, Ecobank Kenya Managing Director, Kassi Ehouman said the steady rise in the number of cancer incidences in Kenya called for intervention by all concerned parties as a strategy for creating awareness and lowering the risk. “In Kenya, just like most African countries, there is very little information on Cancer which is largely viewed as a disease of the rich and old. This has led to an increase in the number of people being diagnosed today compared to 10 years ago hence the need for intervention by all stakeholders,” said Mr. Kassi. He said health is one of the Bank’s key pillars of its Corporate Social Investment Programmes and therefore was glad that the Ecobank Foundation has agreed to release funds towards its Cancer Caravan programme in Kenya. Ecobank Foundation Board Director, Mrs. Muthoni Gichohi said that cancer treatment is very costly and therefore all efforts should be made to educate members of the public on the importance of screening and early detection as a sure way of helping lower the risk. She said that the aim of the foundation is to improve the quality of life and alleviate health challenges across Africa. Studies by the Kenya Medical Research Institute (KEMRI) indicate that cancer is the third cause of death after infectious diseases and cardiovascular diseases in Kenya. According to a policy brief on the analysis of cancer in Kenya prepared my Parliament’s department of research, about 50 Kenyans die from various forms of cancers daily. Sadly, most of the reported cases are diagnosed at late stages when little can be achieved with therapeutic intervention. Increasingly, younger Kenyans are being affected by cancer, unlike in the past, when it was considered a disease of the old. According to 2002 data from the Nairobi Cancer Registry, of all the cancers registered, breast cancer accounted for 23.3 percent, cervical cancer for 20% and prostate cancer for 9.4%. In 2006, around 2,354 women were diagnosed with cervical cancer and 65% died. While prostate cancer has become increasingly common among men, cervical cancer is the second most common cancer among women worldwide. “It is the leading cause of death from cancer among women in developing countries. Over 90% of cases are n developing countries,” said Kenya Medical Women’s Association Chairperson Dr Praxades Okutoyi. “Too many of the Cancer cases are not detected early. This is due to poor awareness or lack of it which is what we are trying to deal with through the Ecobank Cancer Caravan, Early detection is the single most important determinant of survival. If the cancer is found early and has not yet spread, the five year survival rate is nearly 100%.” Dr Okutoyi said. Dr Eliud Njuguna from the Department of Radiology at KNH said that the cancer center at the hospital handles over 2000 cancer cases every year. “Most people are diagnosed at an advanced stage and the Ecobank cancer caravan will improve this by creating awareness that will help us save a lot of people as a result of early diagnosis as well as help in early treatment and save the resources for cancer management.” Dr Njuguna said. Watch this KTN news story (start at 7:53) about the devastating situation caused by the Railway Development Levy and the VAT implemented on September 1st. As a result of the levy, hundreds of CML* patients are going with out the lifesaving drug Glivec, that is donated to Kenyan patients through an agreement with the Novartis drug company. HENZO, the advocacy arm for CML patients, and a member organization of KENCO, has gone to bat for these patients and is working to alleviate this levy. In addition to CML patients, the levy is affecting all other areas of healthcare, including the GAVI Alliance’s initiative to provide HPV vaccines through a pilot program in Kitui County. At present, the Ministry of Health is working to ensure that an amendment passes through Parliament to exempt the healthcare sector from this levy. Sept 13, 2013. Cancer patients hang by a thread as drugs held. Standard News article by Lonah Kibet. Sept 12, 2013. Cancer drugs seized in tax row. Daily Nation article by Mike Mwaniki. Hope and Courage International has launched it’s Theme Song. The song, titled ‘Someone’ was written and performed by Solomon, a member of Hope & Courage, and an upcoming Gospel artist. His words form a call for the community to take action against cancer: http://www.youtube.com/watch?v=yumkmKOWRoM.